The atmospheric Cotswolds estate that has entranced our finest gardeners still has the power to bewitch, says Mary Keen. In 1941, Vita Sackville-West described the garden at Owlpen as a dream. 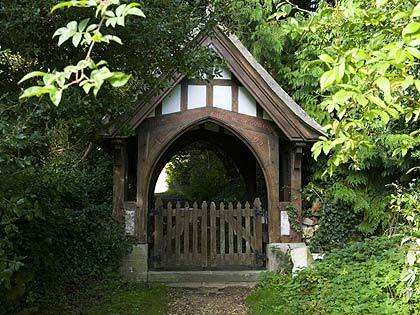 "That tiny grey manor house, cowering amongst its enormous yews, yews that make rooms in the garden with walls taller than any rooms in the house; dark secret rooms of yew, hiding in the slope of the valley," she wrote. 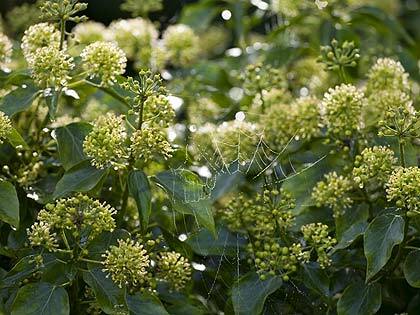 The spell that bewitched the owner of Sissinghurst more than half a century ago still clings to Owlpen today. It is a garden that remains in the memory like few others. Walk among the silent black evergreens and you feel part of a past of accumulated feelings, where the rush of now fades to nothing. There is a hugeness and stillness about such places that connects the soul to ideas beyond time. Children understand this experience of walking through others' dreams, but we grow out of dreaming and become preoccupied with plants. Anyone who has read The Secret Garden or The Children of Green Knowe or Tom's Midnight Garden will recognise that trance-inducing sense of anticipation, that sense of being somewhere else, where anything might happen. These are the places that haunt the memory long after the parades of plants have faded. Owlpen is not a garden to visit for its horticulture, but if history and atmosphere are what you seek, then go. 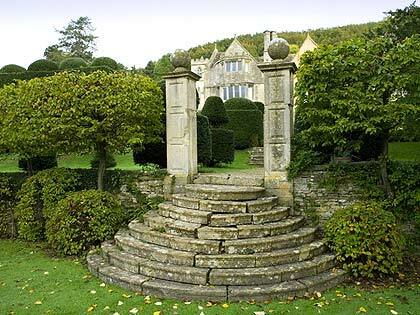 The layout that was admired and recorded by Geoffrey Jellicoe and Gertrude Jekyll seems to have been medieval in origin. Jellicoe wrote that "this early garden is better related in its romantic setting, than that of any other period to the countryside in which it stands." Higher praise than that from the Great Landscaper would be hard to imagine. The enclosed garden in front of the house dates from Tudor times and was probably made by a member of the Daunt family who owned Owlpen from 1462 to 1815. They were rich merchants from Wotton-under-Edge who sheltered Queen Margaret, Henry VI's consort, the night before the great battle of Tewkesbury that ended the War of the Roses. (She is said to haunt the Great Chamber, wearing a fur-trimmed dress and a wimple). The next important phase in the garden's history was in the early 18th century, when the hill was formalised with terraces and beautiful curved steps by Thomas Daunt, who must have had elegant aspirations. By 1807 the house was dilapidated and covered in ivy, because the Daunt descendants had moved out to a larger and more modern house which they built at the east end of the estate and called Owlpen Park, but the garden seems to have been kept going as a place for picnics. A hundred years after the house was abandoned, Avray Tipping described it as "a garden house more than anything else… making its brave fight against consuming time." 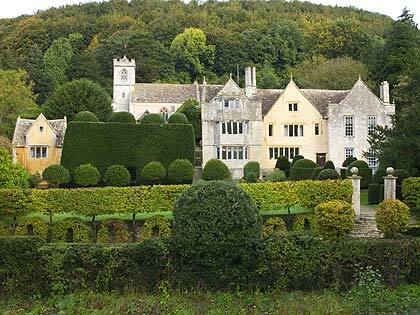 Antiquarians fussed about the state of Owlpen and exchanged letters about how to save it, but it was only when the Cotswold Arts and Crafts architect Norman Jewson made an expedition to the almost-ruined house on his bicycle in the 1920s that help finally came. Jewson revived and repaired the buildings, trimmed the yews and planted the garden, which was hugely admired in its day. Watercolours of bulging topiary and roses on the walls painted during the years between the wars show how picturesque it was; the most traditional of English gardens in the neo-romantic style. But Jewson had no money to keep Owlpen going and after a year of devoted and painstaking restoration he sold the place. Two owners later, Owlpen was bought by a young couple who still live there today and who have more than completed the work that Jewson began. Sir Nicholas and Karin Mander have lived at Owlpen since 1974 and brought up a family of five children in the house, the first family to live at Owlpen for almost 200 years. An "Old English" garden, based on old plans and engravings, has replaced open lawns and fields. 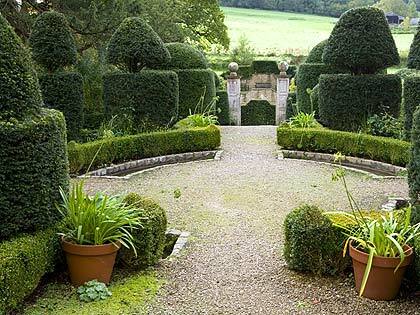 Topiary bulges, roses flop, herbs are back where they belong and, from everywhere, the views out to the pastures and hanging woods of the Cotswold edge are beyond beautiful. To the east of the house is a secret way that leads down to a tiny pond. There are vegetables and nasturtiums in the kitchen garden, washing on the line and everything feels so perfectly right and unchanged that you cannot help loitering. In the sun by the house a stone bench is asking to be sat upon. It is a place for wandering and wondering and for wishing that all houses and gardens that open to the public could share a quarter of the magic of Owlpen, the house that fell asleep for 100 years. Owlpen Manor, Uley, Glos (01453 860261; www.owlpen.com). Open May to September.